University of Nebraska Press, 9781496207753, 84pp. What does it mean to be an American? Luisa Muradyan doesn’t try to provide an answer. Instead, the poems in American Radiance look for a home in history, folklore, misery, laughter, language, and Prince’s outstretched hand. Colliding with the grand figures of late ’80s and early ’90s pop culture, Muradyan’s imagination pushes the reader forward, confronting the painful loss of identity that assimilation brings. Luisa Muradyan is a PhD candidate in poetry at the University of Houston and editor in chief of Gulf Coast: A Journal of Literature and Fine Arts. Her poems have been published in Poetry International, Paris-American, Blackbird, Ninth Letter, West Branch, and the Los Angeles Review, among other publications. 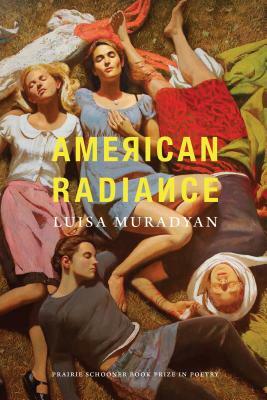 “At once historical, personal, tender, enraged, and aroused, Luisa Muradyan has arrived precisely on time in American poetry. These poems are alive, ecstatic in the earthiest divine sense, lucid where humor blurs with grief, precise when weeping breaks into song. Her force is the force of love, and her voice is unforgettable.”—Kathleen Peirce, author of Vault?